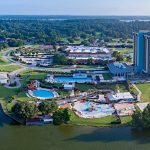 Kissimmee has been without a water park ever since Water Mania closed its doors in 2005 and in the years since, the area’s infamous Highway 192 tourist district has struggled to remain relevant. 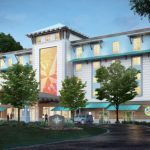 By far one of the biggest and yet least reported aspects of the Margaritaville Resort Orlando is the brand-new Island H2O Live Waterpark. 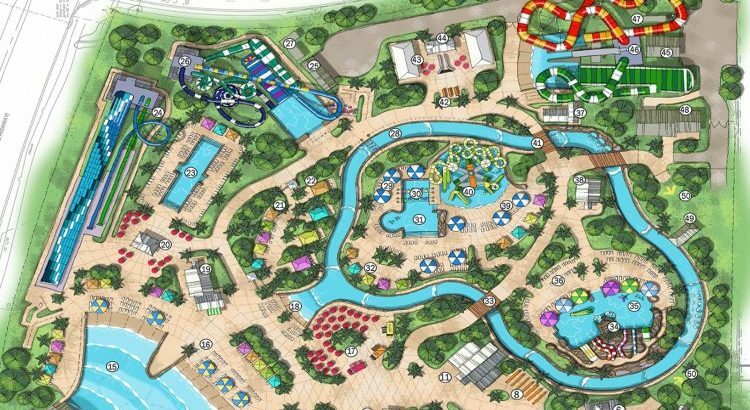 With nine slides and numerous other attractions, the tropical-themed water park will be the largest single-site installation in the southeast for Canadian waterslide manufacturer WhiteWater West, best known locally for their Ray Rush slide at Aquatica and their waterslides found on Carnival cruise ships. 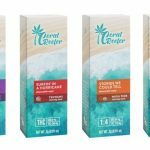 Jimmy Buffett and the Coral Reefer Band performed Hurricane Relief Concert yesterday at the Tucker Civic Center in Tallahassee, FL. 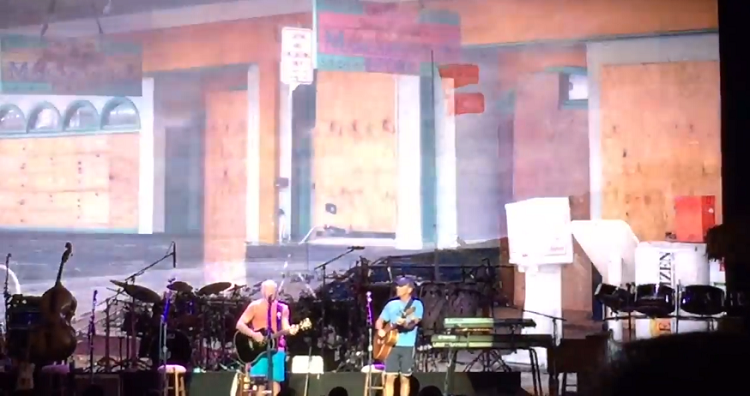 The benefit concert included Buffett, Kenny Chesney,Toby Keith, and Jake Owen. 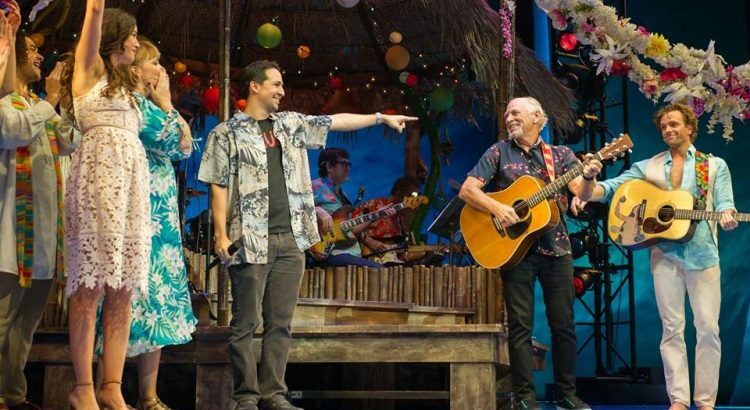 Lin-Manuel Miranda, creator and star of “Hamilton: An American Musical”, spent time with Jimmy Buffett in Chicago this past Saturday. 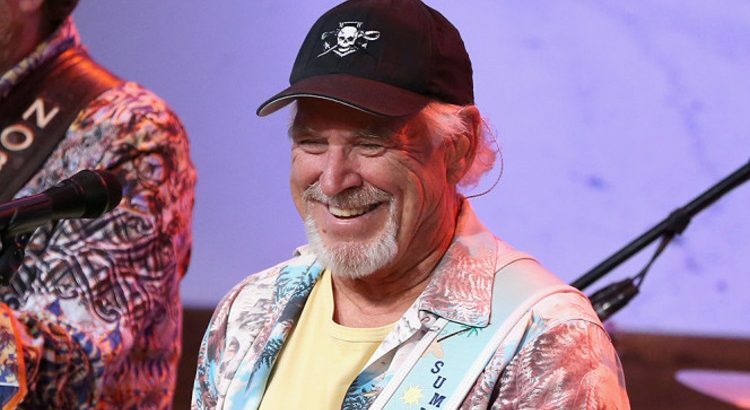 Buffett was Miranda’s guest at a matinee performance of Hamilton at the CIBC Theatre that afternoon, and then Miranda was Buffett’s guest at an evening performance of Escape to Margaritaville at the Oriental Theatre. During the final curtain call Miranda joined Buffett onstage for a surprise performance of the latter’s iconic hit song “Margaritaville”. Ormond Beach residents Don and Susan Veatch arrived at 8:20 a.m. Sunday to be first to put a deposit down on a new home at Latitude Margaritaville. 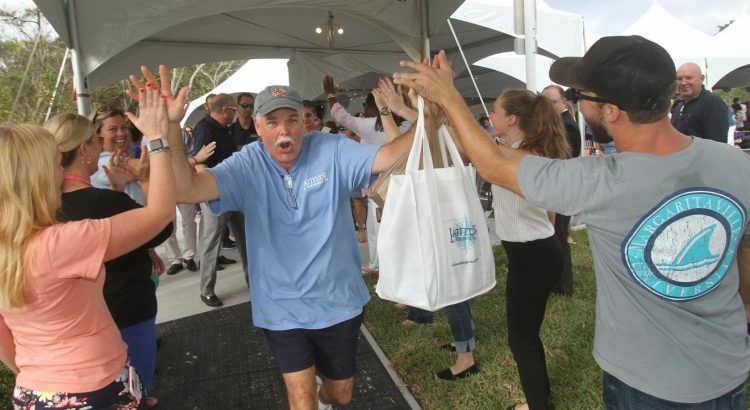 Even though the sales center for the Jimmy Buffett-themed 55-and-older community wasn’t scheduled to open until 9 a.m. Monday, the parking lot on Sunday quickly turned into a party that lasted all night long as more than 200 people wound up camping overnight for the chance to buy one of the first 378 house lots to be made available. The project’s developers, Minto Communities and Buffett’s Margaritaville Holdings, kept the Monday morning crowd of about 375 in good spirits by erecting canopy tents, lighting and tables, and providing live music, a showing of the movie “Jurassic World,” bottled water, snacks, pizza, and even umbrellas when it started raining. “I felt like I was 20 again waiting for concert tickets,” said Susan Veatch, 60, who said she and her husband, 62, drove by several times starting Friday night before deciding to show up Sunday morning to stake out their spot in line. She said they were surprised to be first, but said they were soon joined by others. By the time the sales center officially opened, the developers were already informing those arriving that if they wound up being too late to put a deposit on house lots in the first batch that their names would be placed on a “Paradise Priority List” to be given the first crack when more lots become available. Bill Bullock, the Minto senior vice president overseeing development of the planned 6,900-home Latitude Margaritaville Daytona Beach community, said he expects the next batch of approximately 60 lots will become available at the start of the new year, with additional allotments of 60 or so lots becoming available every two months after that. Mac McAnally earned the award for Musician of the Year, besting Jerry Douglas, Paul Franklin, Dann Huff and Derek Wells. 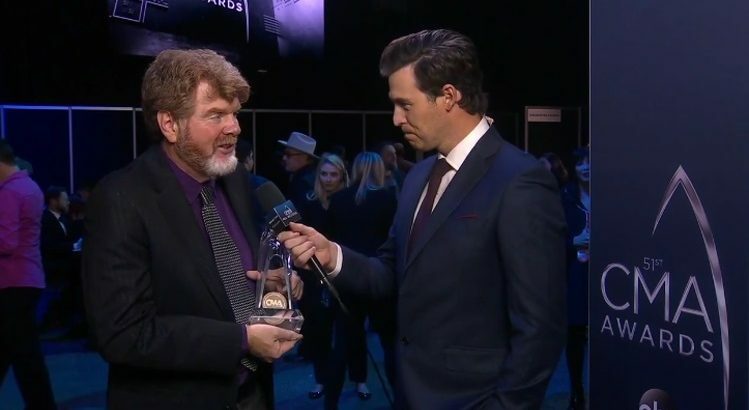 McAnally, a guitarist, songwriter, singer and producer has won this award eight times previously, 2008-2015. He wasn’t nominated in 2016, but returned to the ballot in 2017. Buffett, who calls Sag Harbor, Long Island, home these days, laughs knowingly when it is suggested that in many ways he has far more in common with the character of Rachel than Tully. For in addition to a busy concert touring schedule that takes him to Europe and beyond, he has long been a successful businessman, with chains of restaurants keyed to his song’s themes, licensed products for everything from tequila to chips and guacamole, a beer deal with Anheuser-Busch, a casino-hotel in Atlantic City, and a $1 billion retirement village in Daytona Beach, Florida, now in the works. He also is involved in many charitable efforts, supporting ecological and marine laboratory projects and more recently raising money for hurricane relief. But it is Broadway that calls to him. 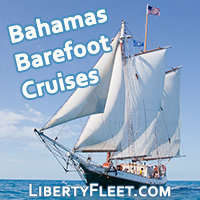 Buffett’s first (if unsuccessful ) attempt at a Broadway musical was two decades ago when he collaborated with Herman Wouk (fabled author of “The Caine Mutiny”), to create a musical based on Wouk’s book, “Don’t Stop the Carnival.” A paradise-turns-into-hell comedy about a man escaping to the Caribbean to salve a midlife crisis, it played for six weeks in Miami and closed, but Buffett turned it into an album. 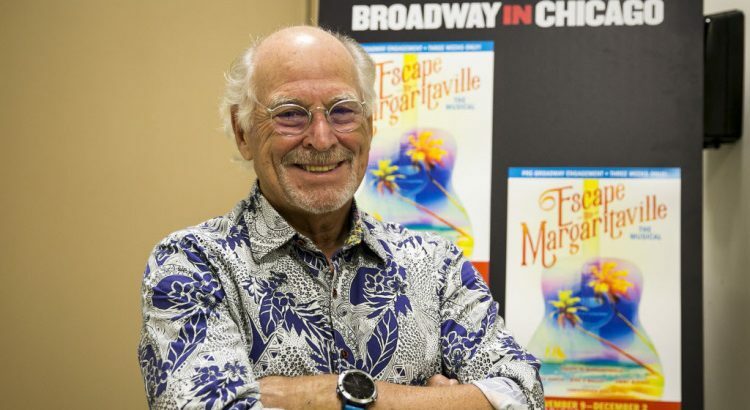 From Pagesix.com: Jimmy Buffett celebrated his Broadway-bound musical “Escape to Margaritaville” in New Orleans over the weekend, followed by a raucous party on the Mississippi River — where “Margaritaville” and Hollywood mega-producer Frank Marshall assumed the alias “DJ Master Frank” to spin tunes.